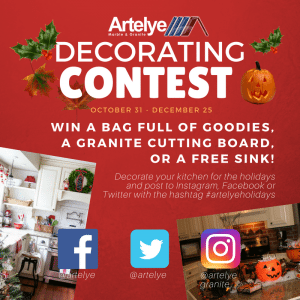 From October 31, 2017 – December 25, 2017, Artelye Marble & Granite is hosting our first Holiday Decorating Contest. We invite our Instagram, Facebook, and Twitter followers to participate in our contest to win one of 4 prizes. Our goal for the contest is to engage with our customers and celebrate the holidays by sharing your proudest holiday photos. See rules for the contest and specifications for prizes and entries. Submissions must be of your kitchen. They must have Artelye Marble & Granite tagged and the hashtag #artelyeholidays. Twitter and Facebook handles for Artelye are @artelye. Instagram handle for Artelye is @artelyegranite. Artelye employees cannot win any of the 4 prizes. Submissions must be uploaded before December 25, 2017, 11:59 p.m.